For an answer, I again turned to Grace Young’s “The Breath of a Wok.” Below, find her recipe for cleaning a rusted or overly sticky wok. Grace says this cleaning technique works best on a gas stove, though I’d give it a shot on an electric stove if that’s all you’ve got, Matt. Better yet, find a friend who’s cooking with gas and promise to make them something delicious after you’ve got your wok in working order. Schmutz — or patina? Patina, with roast pork and bok choy. Heat one cup of salt in the wok over high heat for about one minute. Reduce the heat to low and, using a metal spatula, push the salt onto the problem areas. (Note: hot salt can be very dangerous; handle it with care.) Heat the salt for five minutes. Cool the wok until the salt is just warm, about five minutes, then scrub the warm salt with a soft, clean double-folded rag on any problem spots. Wipe the wok clean, then heat the wok over high heat until it just begins to smoke. Using a paper towel, smear 1/2 teaspoon oil over the inside surface. 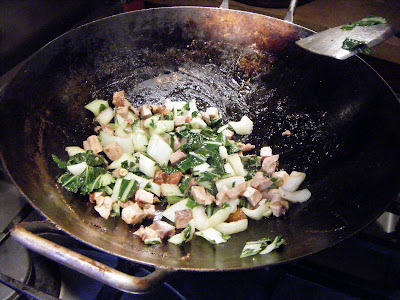 Allow the wok to cool, then rinse under hot water, washing lightly with the soft side of a sponge. Dry the pan over low heat two to three minutes to make sure the pan is totally dry. If the problem is severe, re-season the wok [as directed in my earlier post].